Installation and pro audio division debuts Dante gateways, projector loudspeakers and installation amplifiers at ISE 2019. Work Pro Audio, the installation and pro audio division of Equipson, unveiled an array of sound reinforcement products at ISE 2019, including two new outdoor projector loudspeakers and a new multichannel amplifier. For external applications such as theme parks, aquaparks, shopping malls, stadium and train stations, Work Pro Audio showed the WSF 500 CX and WSF 10 CX PLUS passive two way, full range projector loudspeakers. 1000 watts and 300 watts respectively, the WFS 500 CX and 10 CX PLUS both incorporate horn-loaded 10 inch diameter transducers and 2.5 inch voice coils in a bass reflex enclosure. The high frequencies are reproduced by a 1-inch exit compression driver, a 1.75-inch voice coil and an 80 degree horizontal x 60 degree vertical horn, which delivers consistent coverage across the entire vocal range. Designed with elegance and durability in mind, both loudspeakers are visually discreet and are enclosed in black or white weather-resistant fiberglass that can withstand even the most adverse environmental conditions. Both also incorporate an aluminium grille covered with a protective water repellent fabric and four pole electrical connection cables that enter the enclosure through a cable gland, thus preventing water, dust and moisture from damaging the transducers. The 500CX is a Low impedance loudspeaker, while the 10 CX PLUS is available with either low or high impedance and includes a [email protected] line transformer for installations where long cables need to be deployed. At ISE 2019, Work Pro Audio also introduced the PA 8150, a Class-D amplifier that offers LED indicators and independent volume control on each of its 8 channels for installations such as restaurants and venues where audio needs to be individually controlled in different spaces. 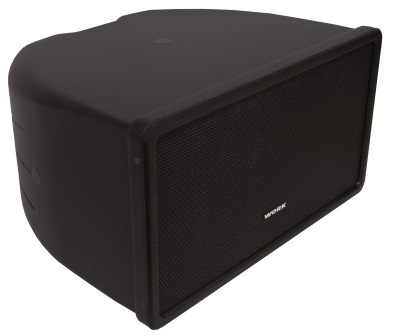 Delivering up to 150 watts per channel and a total power output of 1040 watts, the low impedance PA 8150 has several protections such as short circuit, thermal, ultrasonic and RF and fits neatly into a 1HU 19 inch rack. With the installation market increasingly embracing AoIP, Equipson has added to its BlueLine range of installed network audio products by introducing two new Dante gateways – the DD2 and the DD4. 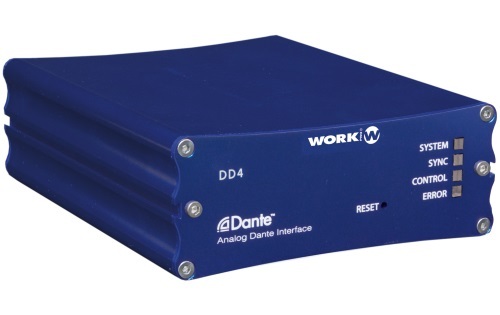 The two input/two output DD2 and four input/four output DD4 allow for the extraction of analog audio signals from the Dante network, as well as the introduction of analog channels within the same network. Both devices are configurable with Dante Controller, use Euroblock 3.5mm connectors and have balanced inputs and outputs to provide greater immunity to noise that interferes with audio signal lines.